My aunt stopped by on Friday and gave me a birthday gift that included a Christmas ornament of a wheelbarrow full of gardening tools and a big apron. They were both simply charming, but until I was up and around a few days later, I didn’t notice how great the apron is really is. It’s tough, made of canvas and has three big pockets along with a string that runs along the front. It will cover me from neck to knees and wrap around. There is a pocket for a digger and scissors and one for gardening gloves, with a pocket left over for plant tape or pruners. Maybe even for both. This will save so many shirts and shorts for me. There are so many times when I think, “eh, I’ll just pull a few weeds real quick,” and, hours later, wind up with stained blouses and ruined shorts. 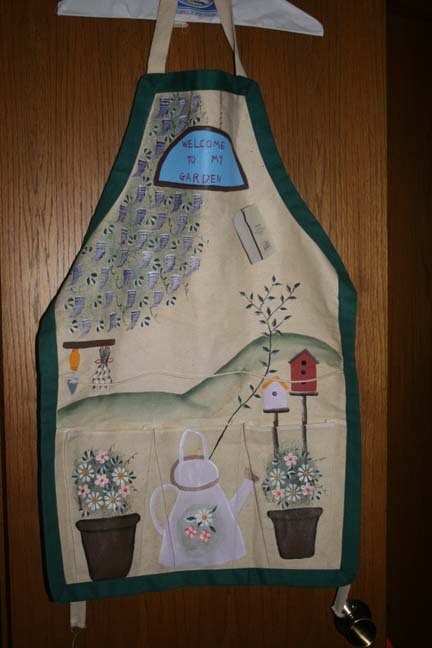 Combine that massive brown hat with my tattered athletic shoes, throw in this apron and that will complete the picture of a truly dorky gardener. I can see the Fitzgerald boys laughing now. But here is my problem. It’s so pretty. It’s handpainted. It looks more like garden art than something functional. It’s really lovely So I have guilt about getting it dirty, stained with pollen and algae and compost slime. But not enough not to use it.